Doom was a spectacular smash hit with gamers, and single-handedly changed the course of video game development. After a substantial length of time without any revolution in the industry, gamers swallowed the Doom Kool-Aid by the bucketful, and this game marked the beginning of a whole new era with a whole new genre that still reigns supreme to this day: the first-person shooter. 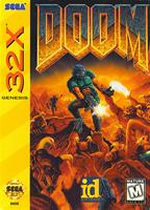 Doom was officially released on the Sega 32X in December of 1994, only one year after Id Software unleashed the original PC version, and one month after Atari released its far superior Jaguar version. It was the second console port (Jaguar Doom was first), and while it’s a highly lackluster port, it was still a success because the home console gaming community was dying to get their grubby hands on Doom and would settle for just about anything. Everything seemed in order with this version, if you judged by EGM’s outrageous score of nine. Both the misleading screen shots on the back of the box and even the title screen were impressive enough. But when you finally selected the difficulty level and started the game, you knew you were in trouble. From the moment you realized that the game wasn’t running in full screen, and you saw a humongous border that surrounded the play field, you could already feel a sense that you’d been slighted in some way. What was this border? I didn’t see that on the box screen shots! A border would be fine, if it translated into better resolution and a decent frame rate, but I found neither of those things here, and I couldn’t play this game for more than fifteen minutes at a time because the horrible frame rate and blurry enemies put a nasty strain on my eyes. Speaking of blurry enemies, both they and other objects were recognizable, but appallingly pixilated at any distance. Far off monsters appeared as nothing more than a couple different colored dots, and projectiles fired from far way were very hard to pick up until they are fairly close, which left you with little time to maneuver out of the way. Also, unlike the screen shots on the back of the box, which lead you to believe that enemies could face eight directions, they could actually only face one direction which was always towards you. It begs the question, where did the screen shots on the box come from? Graphically, this game is a mess and not a good representative of Doom in general. Honestly, this 32X version compares more with the SNES version than the Jaguar game with which it was meant to compete. One thing I thought this version might have going for it, was the inclusion of in-game music, which was missing from the Jaguar port. Well, as it turns out, I wasn’t missing much. The tracks featured were too corny for me, and I was glad to turn the music off. It appears the only thing that wasn’t downsized here were the sound effects, which weren’t noticeably different from the original in any aspect that I could find. For instance, you could hear the satisfying ‘splat’ sound when murdering zombies with exploding barrels, and the familiar grunts and groans from the undead soldiers. Don’t expect to kill zombies and bull demons with the BFG 9000 though, as this weapon isn’t available in the game without using a cheat code. That’s right, the biggest weapon you could harness in 32x Doom was the Plasma Cannon, unless you input an annoying cheat code. Also, if you did input a cheat code, you couldn’t play all the stages in the game. There were only fifteen stages in this version, with two extra stages awarded if you played through without using any cheats. This I just don’t understand. To use the single most recognizable weapon and feature from the Doom franchise, the BFG 9000, you were punished with a shorter game. It would have been nice if the cheat codes would do something positive, like unlocking more monsters to fight against. As it is there were only seven different monsters, with the biggest being the Baron of Hell. This is an acceptable amount, but it sure would have been nice if all these cutbacks in features would have led to 32X Doom having just one thing the competition didn’t have. That’s unfortunately not the case. The one aspect of this game that saved it from being a total abomination is that it still played like the PC original. A six-button controller was needed to have better access to weapon selection, but the standard three-button controller would work, albeit with more annoying commands to cycle through weapons. Even with the limitations of the original Genesis controller for this game, the control was authentic and smooth, and I found I was able to quickly maneuver through stages with the same dexterity as found in the Jaguar game. There was no save feature present, but to make up for that you were allowed to start on any level from one to fifteen. For a seasoned veteran of Doom, this game could be completed from start to finish fairly quick, that’s if your eyes didn’t start to bleed first. This is not a game I would recommend or actively seek out with a serious gaming session of Doom in mind. Even from the same era, there are better versions available, with more options, features, levels, and except for the SNES edition, universally better graphics. This is a game that is best left for the 32X collectors, but not even this group is safe from defects. On the box, the spine has a misprinted 32X logo. Normally the 32X logo is printed in the same copy direction as the game logo. 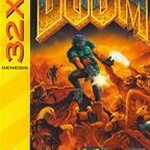 For Doom, the 32X logo is facing in the opposite direction, so when it’s displayed alongside other 32X titles, it doesn’t match. This might not be a big deal to most people, but it’s just more evidence of the whole half-assed, lazy quality control that ruled Sega during the 32X lifecycle, and Doom seemed to suffer the most. Some pictures courtesy of FantasyAnime. accessable i read about a while ago. make your own doom engine 32x game.